The Charleston RiverDogs celebrated their 25th season in team history, their "175th in Dog Years," in 2018 and played the most one-run contests in the South Atlantic League in front of a frequently packed Joseph P. Riley, Jr. Park crowd, en route to a second straight season with 300,000 fans through the gates. First-year manager Julio Mosquera led the New York Yankees affiliate to a 64-72 record, and the former Major League catcher saw 15 of his players get promoted from the Charleston clubhouse to higher levels in the system. The RiverDogs got out to one of the best pitching starts in professional baseball, going into a series at Hagerstown on May 15 with the best ERA (2.35) and WHIP (1.03) at any level. Charleston's bullpen carried a 1.52 ERA in 112 1/3 innings to that point, and the overall staff continued to carve through SAL hitting all season. 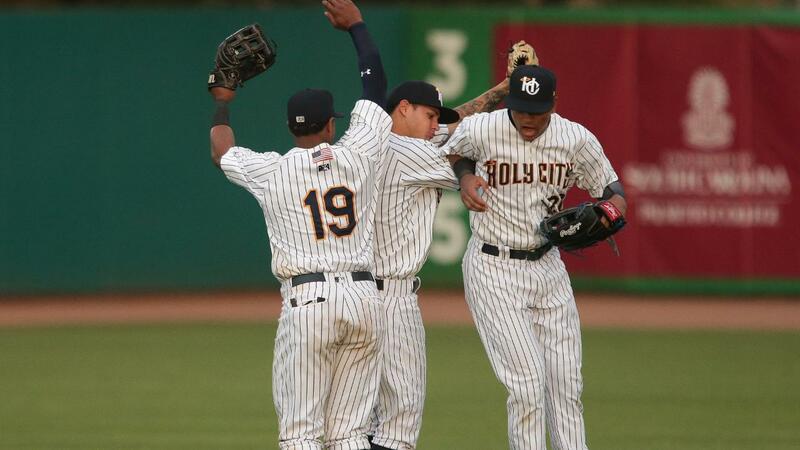 The Holy City finished the campaign with a 3.29 staff ERA, and although they came up shy in breaking the franchise record for strikeouts for the third consecutive season, the Dogs broke the team walk record with 339, 19 fewer than the 2009 RiverDogs. Charleston's pitching success was highlighted by a combined no-hitter in Delmarva on August 16. RHP Janson Junk , RHP Austin DeCarr and RHP Daniel Alvarez all combined for just the second nine-inning no-hitter in RiverDogs history, the first since the inaugural season as the RiverDogs when Jim Brower, now an assistant coach with the Seattle Mariners, completed the feat himself with a 3-0 win over the Columbus RedStixx on August 3, 1994 at College Park. It marks only the seventh no-hitter in franchise history (circa 1980 since Charleston has had a continuous team in the SAL), with the most recent being a 7-inning no hitter by Jason Standridge on June 28, 1999 vs Columbia. The milestone was the Dogs' first combined no-hitter. The RiverDogs played in a league-most 57 one-run games in 2018, contests in which they went 26-31. Eighty-one of the Holy City's 136 games were decided by two or fewer runs, the second most in the SAL to the Kannapolis Intimidators. The Dogs walked off their opponent seven times, including extra-inning game-winning hits from Dermis Garcia in each of the final two Friday games of the season. Charleston went to extra frames 13 times, going 5-8 under Minor League Baseball's new pace-of-play rules that started a runner at second base in each extra inning. The RiverDogs went to 11 innings just twice, both against the Asheville Tourists. After finishing the first-half of the season 6 1/2 games behind the Southern Division-leading Rome Braves, the RiverDogs started the latter part of the campaign at a league-best 12-4 mark before promotions and injuries dwindled their second-half chances. Still, the Dogs endured and lost just one of their last five series, including a four-game series victory to end the season that spoiled the West Virginia Power's postseason hopes. Although the RiverDogs finished below .500 for just the second time in seven seasons, Mosquera and his staff saw many talented prospects come through the Lowcountry on their way to potential Major League careers. Seven players who donned a RiverDogs uniform in 2018 ended the Minor League season on the MLB Pipeline's top-30 Yankees prospects lists, including RHP Garrett Whitlock (#11), who went 2-2 with a 1.13 ERA in seven starts for Charleston and compiled a 1.86 overall ERA between the Dogs, Advanced-A Tampa and AA-Trenton. The Alabama-Birmingham product made seven starts with Charleston, allowing one run over his last five outings (30 innings, 0.30 ERA). Then 21, Whitlock made his final Riley Park appearance on May 5, allowing two hits and striking out 10 Lexington Legends over seven shutout innings. RHP Deivi Garcia (#12), a 19-year-old phenom who took a seven-inning no-hitter into extra innings in his Tampa debut before going five hitless frames in his Double-A debut to end his regular season, got the nod eight times for the RiverDogs, pitching to a 3.76 ERA in 40 2/3 innings. Garcia had a knack for making a strong first impression, as the Bonao, D.R. native struck out 10 Greenville Drive hitters over five innings in his RiverDogs welcome on June 17. During his time with Charleston from June 11-July 30, Garcia ranked third in Minor League Baseball with 63 strikeouts. The teenager only improved when the Yankees advanced him, as Garcia went 2-0 with a sparkling 1.27 ERA in five starts with the Tampa Tarpons. His impressive Trenton debut was the only start that Garcia made with the Thunder in 2018. RHP Nick Nelson (#18), a second-year RiverDog, was the first to get promoted in 2018. The 2016 fourth rounder struck out 12 in his home debut on April 13. The former Gulf Coast JUCO arm recovered from a 3-12 record in 2017 by posting an overall 8-6 record with a 3.55 ERA between Charleston, Tampa and Trenton in 2018. 18-year-old RHP Roansy Contreras (#19) became the youngest RiverDogs pitcher since Manny Banuelos in 2009 when he was reassigned to Charleston on July 21. The Peralvillo, Dominican Republic-born hurler couldn't claim his first win at Class-A but posted a respectable 3.38 ERA in eight starts with Charleston. Former high school third round draft pick RHP Nolan Martinez (#25) was promoted to Charleston from Short Season-A Staten Island where he went 4-0 with a 1.23 ERA. Martinez struggled after his call-up, going 0-4 with a 6.48 ERA, but held opponents to a .264 batting average and made a quality start in his RiverDogs debut on August 7. RHP Glenn Otto (#27) made just two appearances in the first week of the season before his scheduled first full season was cut short because of injury. INF Dermis Garcia (#30) climbed back into the top-30 in the final week of the regular season and proved the analysts right with a 19-game on-base streak in the final full month of the campaign. The 20-year-old hit 15 home runs and drove in 50 runs in 2018, both leading all Charleston batters. Garcia's strong second-half included a two-homer game, one of which was the game-winner, on the final day of the season. Twelve of the corner infielder's 15 long balls came in the latter-half of the year, tied for fourth in the league during that time. Another impressive Yankees prospects in the Lowcountry included 2018 Top Dog, OF Pablo Olivares . In 56 games with Charleston, the outfielder hit a league-best .338 while reaching base at a .404 rate. Olivares' season was ended on July 8 when he was struck in the hand on a bunt attempt in Columbia. At the time of the mid-at-bat injury, the 20-year-old was one plate appearance shy of qualifying for the SAL leaderboards for the first time. Had he finished the plate appearance, Olivares would have ranked second in batting average while ranking first in OBP and fourth in OPS (.857). The Venezuelan import was voted on by the fans as the "Top Dog" of the 2018 season. His .338 batting average was the highest in RiverDogs history for any hitter that accrued at least 200 at-bats and was the second-highest in the franchise's history (Cliff Pastornicky, Charleston Royals, 1982, .343). Slugging OF Steven Sensley was a must-watch hitter at The Joe, as the former Louisiana-Lafayette Ragin' Cajun touched off for 10 home runs in 67 games with the RiverDogs. The 12th rounder smacked an opposite field, game-winner in the eighth inning the same night Nick Nelson struck out a dozen on April 13. A night later, Sensley deposited one of the longest shots of the season over the videoboard in right centerfield for one of the most impressive home runs at The Joe all season. Catcher Jason Lopez was quietly one of the strongest hitting catchers in the South Atlantic League during his 72 games with the RiverDogs. Lopez reached safely in 14 of his last 16 contests with Charleston and went 24-for-his-last-61 (.393), ranking third in the SAL over that span. Lopez slashed at a .285/.330/.453 mark with eight home runs, ranking in the top-5 in BA, OBP, and slugging among SAL catchers with at least 150 plate appearances. Prior to the 2018 campaign, he had never hit more than one homer in each of his first three professional seasons. Three different RiverDogs won South Atlantic League Pitcher of the Week for the final three weeks of the season. Janson Junk, RHP Alex Mauricio and RHP Shawn Semple each earned the honor in the final stretch of the campaign. Semple's two outings that qualified him for the award were his only two appearances with the RiverDogs. The right-hander pitched six shutout innings with 10 punchouts in his debut on August 27 in Columbia. Infielder Chris Hess hit safely in 24 of the RiverDogs' first 29 games, none of which were more monumental than a 3-for-5 effort with five home runs and six RBI on the opening road trip of the season. The Rhode Island product crushed first and third inning home runs in Charleston's 10-2 victory. The scalding start contributed to Hess' All-Star honors in June. In Charleston's second home game of the season, 2016 draft pick Nick Nelson struck out 12 Kan­napolis batters over five innings in a 2-1 RiverDogs victory where Steven Sensley blasted an opposite field game-winning home run. A night later, Steven Sensley deposited a moonshot over the videoboard, his third of the season. During the seventh inning stretch, the 4,373 fans tossed colorful bags of corn starch as part of "Joseph P. Riley and the Amazing Technicolor Ballpark Night." In a doubleheader against Columbia, middle infielder Wilkerman Garcia capped off a 3-for-4 game one with a two-run, two-out walk-off home run over the right field fence in the bottom of the eighth of a scheduled seven-inning contest, 7-5. The Dogs held on in the nightcap, 2-1, to complete the doubleheader sweep. Garcia's long ball was Charleston's lone walk-off homer of the season. Outfielder Dom Thompson-Williams played the first series of the season before hitting the dis­abled list. The former South Carolina Gamecock returned with a vengeance in early May, going 7-for-11 with five home runs and nine RBI over a three-game stretch in Hagerstown. DTW crushed three home runs in consecutive at-bats in a doubleheader on May 15. "Bomb" Thompson-Williams played one more game in the Holy City before being promoted to Tampa where he homered in his Advanced-A debut. Left fielder and 2018 "Top Dog" finalist Pablo Olivares robbed Trevor Craport's would-be game-tying home run to start the top of the ninth. The RiverDogs hung on to defeat the Shorebirds, 3-2, and Kyle Zurak earned his third save of the season. Wilkerman Garcia, Steven Sensley and Dermis Garcia smashed three home runs on as many pitches in Greenville, starting with Wilkerman Garcia's grand slam. The eight-run inning put the RiverDogs up 9-1, but the Drive scored nine unanswered runs and walked off the Dogs in 10 innings, 10-9. Third baseman Chris Hess and outfielder Steven Sensley played for the Southern Division in the South Atlantic League All-Star Game in Greensboro. Hess finished the first-half with a 4-for-4, 5 RBI contest against Green­ville on June 16, raising his average to .266 with 25 RBI. Sensley was a .275 hitter with a team-best nine home runs at the break and played in three second-half games before being promoted to Tampa on June 27. Infielder Dermis Garcia hit a liner to centerfield that Rome's Drew Waters dove for and missed, allowing the ball to trickle to the wall and giving first-year manager Julio Mosquera the confidence to send Garcia home. The 20-year-old nearly hit a second home run with a double high off the centerfield wall in his final at-bat, finishing the night 4-for-5 with two RBI and two runs. The Dominican Republic native got his cardio in as he also stole his first base of the season. Pablo Olivares joined the RiverDogs on April 24 and proceeded to dominant the league from May through July 7. The 20-year-old hit .358 (62-for-173) over that span, the best mark in the league. He left a July 8 game in Columbia with a mid-at-bat injury, one plate appearance shy of qualifying for the South Atlantic League leaderboard where would have have ranked second in batting (.345), first in OBP (.412), and fourth in OPS (.874). The Yankees prospect did not return to the field for the rest of the season. Olivares' absurd start to the second-half including an 8-for-15 line with three home runs and 11 RBI over a three-game series in Lexington. The Venezuelan outfielder's tear came during an 11-game hitting streak, a stretch in which he went (.404). For one night only, the Charleston Boiled Peanuts took over The Joe. In honor of the Lowcountry's legendary road­side delicacy, as well as late local celebrity peanut vendor, Tony the Peanut Man, the logo sports a peanut wearing Tony's iconic sweetgrass hat in a pot of boiling water. There were boiled peanut vendors throughout Riley Park, in-game peanut-themed gimmicks, and Tony's family carried his still-running tradition of tossing bags of boiled peanuts to fans during the game. Janson Junk, Austin DeCarr and Daniel Alvarez all com­bined for just the second nine-inning no-hitter in RiverDogs history, the first since the inaugural season as the RiverDogs when Jim Brower, now an assistant coach with the Seattle Mariners, completed the feat himself with a 3-0 win over the Columbus RedStixx on August 3, 1994 at College Park. It marks only the seventh no-hitter in franchise history (circa 1980 since Charleston has had a continuous team in the SAL), with the most recent being a 7-inning no hitter by Jason Standridge on June 28, 1999 vs Columbia. Thursday's milestone was the Dogs' first combined no-hitter.